Philadelphia: Why the U.S. can’t have nice things? That’s a bit harsh on the City Of Brotherly Love, but then again, that same city was a bit harsh on poor, defenseless hitchBOT. The sightseeing robot was able to explore Canada, Germany, and the Netherlands without nary an incident—just tagging along for the ride. But it hit a snag when it came to the U.S., a snag known as Philadelphia. That’s where it was beaten and ripped apart like so much garbage. What’s a robofather to do when his robokid has been destroyed? Mete out bloody revenge, of course. 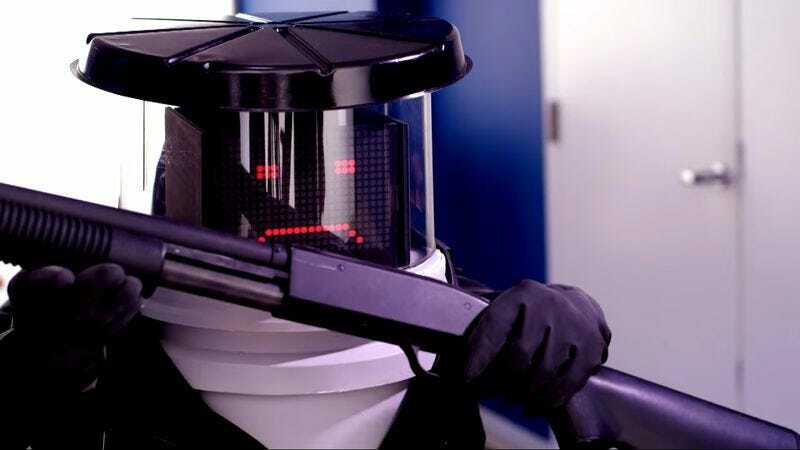 YouTube user Boyd Vico has created a trailer for the fake film Coded To Kill, which looks like a cross between Death Wish and that robot from Space Camp. In it, VENGE-BOT goes full vigilante and starts cleaning up the streets of Pennsylvania, though he leaves plenty of death and destruction in his wake. The short was made for SyFy’s Reactor show, and is as good a tribute as any to the fallen hitchBOT, taken before its time. While hitchBOT’s love for humans will never fade, neither will VENGE-BOT’s burning desire for justice.